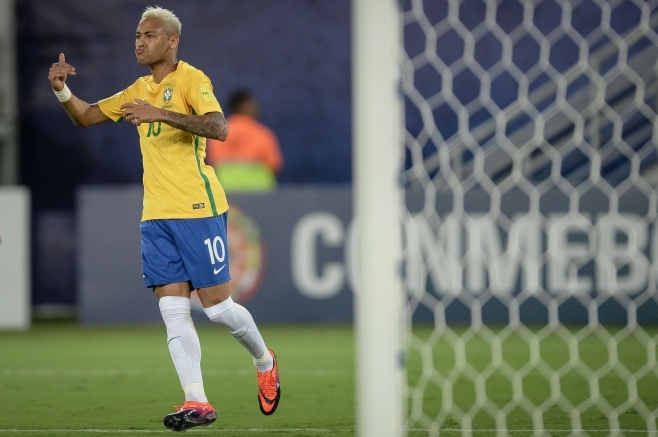 In September qualifiers against Ecuador and Colombia, Brazil showed their resilience under new boss Tite. They fought and won impressively against Ecuador in the altitude of Quito. Chile’s 3-0 defeat at the same stadium last night emphasised what an excellent result that was. They then duly dominated an in form Colombia side in Manaus, winning 2-1 but in reality, the gap between the teams was significantly larger on the night. The match against Bolivia provided a different test. How would the Seleção cope with the pressure of expectation? Especially now the mood has been elevated by Tite’s appointment. In fairness, Dunga rarely faltered in this type of qualifying fixture. He was able to get results, but the performances still felt lacking in pizazz. History weighs heavily on Brazil, when they play a side like Bolivia at home, they are judged on how well they win. That means the style with which they achieve the victory, as well as the margin. Tite has built his reputation as an excellent tactician, but he has been known for football that, while smart and effective, is not the postcard Brazilian stereotype of futebol arte. Last night however, Brazil got somewhere close to that gold standard, mercilessly swatting Bolivia aside. Willian was dropped for Coutinho in the starting line-up. Tite isn’t one for orthodox wingers, he prefers playmakers to drift in from the flanks. This is where Bolivia just failed to cope with Brazil’s movement. Neymar drifted in from the left and helped himself to identical assists for Filipe Luis and Gabriel Jesús, as he swaggered in field and steered reverse passes between the full back and centre half. The Barcelona man created the first goal through sheer determination, harrying Raldes into ceding possession. Neymar then played a one two with Gabriel Jesús that demonstrated this burgeoning forward partnership. For too long, Neymar has been Brazil’s sole reference point, but in Jesús, he has somebody to riff with. On the right hand side, Coutinho constantly drifted in field to create overloads, but Tite’s real masterstroke was the selection of Guiliano in midfield. The Zenit man stayed close to Coutinho and the pair were able to smuggle their way through the Bolivian backline together time and again. Guiliano’s close control in teeing up Coutinho for the second goal was possibly the highlight of the evening. A beguiling piece of footwork in the box, followed by an altruistic pull back to the onrushing Coutinho, when the temptation to shoot must have been great. Effectively, these two partnerships destroyed the Bolivians, with Neymar and Jesús linking up left to centre, and Coutinho and Guiliano moving from right to centre. The Seleção’s danger men always had an out ball against a heavily manned defence. Though the visitors generously aided and abetted their hosts with some dreadful defending. If Raldes’ daydreaming in the face of Neymar’s pressure for the first was a notable error, Edward Zenteno’s decision to hang a full seven yards behind the defensive line and play Jesús onside for the fourth was the bow on the wrapping paper. The only downside is that Neymar again allowed himself to be frustrated by Bolivia’s roughhousing. He picked up another booking for retaliation that sees him miss Tuesday’s match against Venezuela. Whilst he is often treated roughly, opponents will continue to adopt these tactics whilst he continues to respond to them. That said, Brazil ought to be able to handle Venezuela without Neymar and had he earned this booking in Mérida, he would have missed the November clash with Argentina in Belo Horizonte. A far bigger penalty. Roberto Firmino staked his claim for Neymar’s spot in Venezuela with a fine headed goal in the second half. He has operated in a fluid front three with Coutinho this season at Liverpool and it would probably make the most sense to utilise that connection again in Venezuela. Tite remains ensconced in his Brazilian honeymoon period. With Chile losing and Argentina drawing in Peru, they could tighten their grip on World Cup qualification if they win in Venezuela on Tuesday night. Brazil will be massive favourites to do so. BRAZIL; 1.ALISSON, 2.DANI ALVES, 3.MIRANDA, 13.MARQUINHOS, 6.FILIPE LUIS, 5.FERNANDINHO, 8.RENATO AUGUSTO (c), 18.GUILIANO (20.Lucas Lima ’76), 11.COUTINHO, 10.NEYMAR (19.Willian ’69), 9.G.JESUS (21.Firmino ’67).